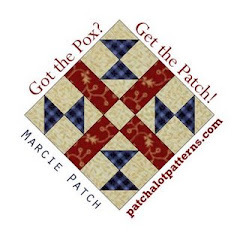 This quilt is a free pattern from Marcie Patch at Patchalot patterns. I don't know how to link to her yet, but she is easy to find. Fun patterns! Thank you so much, Marcie!! We had a wonderful Christmas celebration! Our son was home, with his new dog Bella, and it was just so much fun!! I hope you all are having a wonderful holiday too. We of course ate too much, and just had a wonderful time together, and were spoiled quite rotten. Our son is on his way home, because he plays in one of the Bowl games coming up, so we already miss him of course! Hope you are having a wonderful Christmas day too!! Hope you are having a busy, fun time gettng ready for Christmas. I sure am! I have been working the last 4 days, and today, my day off,is the last push to get ready for the big birthday celebration (Christmas). So I have lots to do, nothing new about that, everyone does at this time of year. I have bad news, too... I was in a horrendous automobile accident on the 13th and my vehicle was totalled. The person who ran into me did not have insurance, did not have a driver's license or any ID, non-English speaking,and tried to leave the scene, but his vehicle was too banged up to go very far...so my car is a total loss! But, I am alive!! Banged up and sore all over, but at least I am here and kickin'!! Ok, this is my "public service" message for everyone: Wear those seat belts!! Mine save my life for sure. I am sure I would be "roadkill" if I had not had mine fastened. So you do it too!! On the quilting front, I have been working on Bonnies' mystery..and am about to run out of background fabrics!! Isn't that a nice way to stash bust?? I love it! and can't wait to see the finished product. I am enjoying the journey so much. This is a picture of my drunkard's pathway quilt. I actually got to liking the curved piecing! The anticipation is much worse than the actually doing of it, it got to be pretty easy. It is hand-quilted, hand stippled in the borders. Fun!! Hope everyone is having a blessed, warm holiday time. Today I was at work at our hospital. I had (as my patients) one drug addict and a psycho person. Not that I don't have sympathy, but I am tired out... One wanted drugs, and called every 10 minutes (no kidding) for them, and one wanted the people in her head to stop talking, she needed to sleep!! Me, too...a nap would have been great... I cherish my days with my little old sweet ladies! I am talking 90 years plus old ladies, sweetest ever! They are my big time favorite patients. So I came in and took a picture of my littlest quilt!! Remember that vine I made for my brown quilt border that didn't work? Well, there were the littlest of green pieces left over, and they became this...my DH is holding it in his hands. I love the tiniest pieces of throw away, they hold great charm for me. Are you ready for Christmas?? I will be soon! These borders are very red....wonder why they look hot pink in the pictures? Oh,well, on with the hand-quilting! Ok, here it is version 2. I can't take it apart anymore and redo it, and anyway, I like this version! The red border made it a red quilt! I learned lots about color and other lessons as well with this quilt, the chief one being to take time to audition fabrics before sewing them down! I had a great time ripping off the borders, let me tell you! (not) But I like it now, and although I never imagined it with red borders, they sparkle for me and I like that. I also made cookies for DH and no-sugar raspberry jam from scratch for us. And all the jars sealed! Yahoo! Thank you all so very much for your input, help , and honest opinions about the log cabin quilt in my previous post. I really appreciate all of you so much!! So round two is coming up! Part 2 is done of Bonnie's mystery quilt! plus a few extra pieces for good measure. I have lots of strips left too. Hope we need 1.5 inch strips again...I pinned them in tens like Bonnie and Keryn suggested, that makes it easier to count them later. They are little fellas, these nine patches, aren't they?? I also bagged up 17 bags of leaves today!! and they are still falling fast. I know I will be sore tomarrow. Off to clean house, quick dinner, then relax for a while. Hope you all have a wonderful weekend! Ok, I just can't stand the dark brown! Seems to dampen the lively colors in this quilt, so off this border comes!! Oh, well, I guess this is the way you learn what you like, right? I am looking forward do completing part two of Bonnies' mystery quilt! The first part was fun and fast and I made a glorious mess of strips. 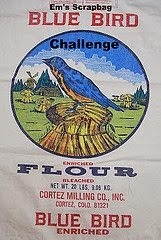 How many are doing this mystery quilt, does anyone know? I put borders on the log cabin quilt. And I just can't stand it at all. So in the spirit of going forward, I put the green vines on two corners... So the name of the quilt is "Vines on my Log Cabin". But I am trying to bust stash, and the biggest piece of fabric I had was the brown, and someone mentioned to put a darker border as to not stand out, and so I did. Is it so terrible??? Would love opinions, please. It is going to be in a real log cabin some day, so maybe it is OK. I have three days off in a row...so TADA! I am finishing some things up! I have had this log cabin quilt top cut out for five years. It is about 56" by 64 ", so with borders, it will be a nice cuddle quilt size. Now was the time to giterdun!! I just need to add borders, and I haven't decided yet...opinions please?? I received my cutest Santa in the mail from Finn!! I still need to finish him up and decorate him a little...but isn't he the cutest? Thank you so much Finn!! And the funnest (never mind my use of the English language) thing is...I am doing Bonnie Hunter at Quiltville mystery quilt!! and I made a delightful mess yesterday cutting strips and then cutting segments. I think I ended up with a lot more of these 3.5 inch segments than Bonnie said to make. Maybe I will make a little quilt with them!!! It is just the right time to join and do this mystery quilt if you want to, we just started. Now, I just have to vacuum and dust and clean the mirrors, and... finish decorating the house....But I sure had fun yesterday!! Our little Rusty poodle wandered in to one of the pictures. He is getting very old, and just wants to be held and loved all the time, so we accommodate that. He sure is a great sweetheart of a companion. He weighs about 11 pounds, so is pretty tiny. Hope you all have a wonderful day and everything goes just the way you like it. Well, this is the way it seems to go. I am off for a day and get lots done, then work for several days, then back to blogging. So...I wanted you to see what I finished up today!! Yahoo!! I finally finished my Log Cabin quilt blocks that have been languishing for over 5 years!! 54 of them done. That is a pretty odd number, so I will figure out what to do to fill in the holes. The poodle is ensuring quality control. I wanted to share some pictures of some work completed. I love new techniques (at least new to me), and the little Sunbonett Sue is colored!! Not fabric!! and hand quilted. Such fun to do. The other little much wrinkled quilt is hand applique of the Columbine flower, the state flower of Colorado, where I was born. There is some Indian Paintbrush as well. Of course, it needs to be quilted and bound. These are my favorite flowers, and I was so tickled to find the pattern in the quilt shop in Durango, Animas Quilts. That is a fun shop if you ever get to go!! and is on the main drag through town. I have been enjoying all of your blogs, it sure is entertaining...so fun it cuts into my quilting time! or was that housekeeping time? Judy L has a new pink quilt I am dying to make, and Bonnie at Quiltville is making a mystery quilt. How can a girl resist? :) Is anyone else doing Bonnie's mystery quilt? and in what colors?? I hope you all have a wonderful Saturday and upcoming week! !